RSI is one of the popular oscillator indicators and is considered quite reliable. Since it was made by Welles Wilder in 1978, the RSI indicator is used in trading in all types of markets, including by forex traders. However, there are actually certain tricks to using RSI that can affect the accuracy of trading results, but not many people know. Traditionally, the RSI indicator is used to determine the right time of entry by looking at overbought and oversold levels, and detecting possible changes in direction of the trend by observing divergence towards price movements. In addition to the prevalent function of the RSI, here are three tips from traders who might be able to help in using this indicator. 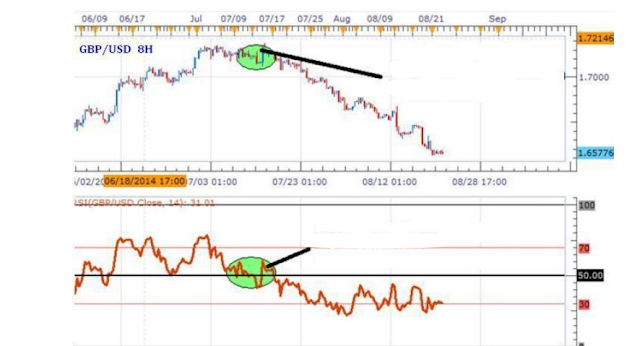 Tip 1: In the case of a strong trend, ignore overbought and oversold the RSI indicator. When prices move trending strongly in a relatively long period of time, the entry method relies on overbought and oversold the RSI indicator becomes inaccurate. This indicator is made by comparing the number of positive (higher) price changes with negative (lower) price changes for a certain period. This ratio is plotted in the range 0 to +100. If after this time period the price movement does not change (such as when trending strongly), then the RSI will remain in overbought condition (when an uptrend condition) or oversold (when a downtrend condition). In the example of GBP / USD above, the downtrend movement is strong and the RSI remains in the oversold area for a considerable period of time. In this case, if you buy when oversold, it will cause a loss. The solution, before observing the RSI indicator, traders must see the trend indicator first. Trend strength indicators that are often used are MACD, Bollinger Bands and ADX. Tip 2: Pay attention to level 50 on the RSI (center line) indicator. All oscillator type indicators have a middle level or center line, usually at level 50, or 50%. Likewise on the RSI indicator. This often overlooked center line shows the momentum of changing direction of price movements when a retracement occurs, or even when there is a change in direction of the trend. What is the function of the center line on the RSI indicator? In the example chart GBP / USD above, it appears that the center line functions as a support level. When the RSI indicator breaks for the second time, the price switches to a downtrend. 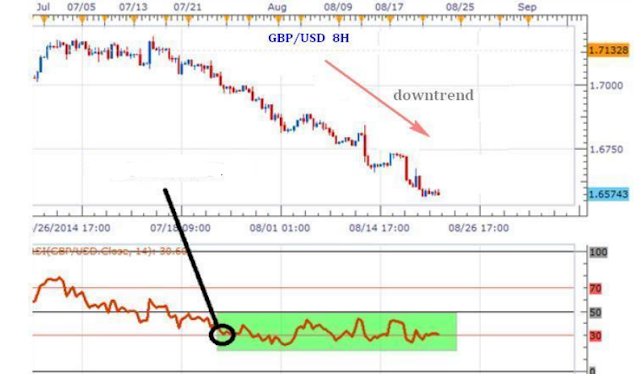 Tip 3: Use of the RSI indicator parameter needs to be adjusted to the time frame trading. Usually, the default time period parameters on the trading platform for almost all oscillator type indicators are 14, including RSI. Based on experience, period 14 is suitable for Daily time frames, but less accurate for lower time frame trading. RSI indicator maker Welles Wilder also recommended using period 14 on the Daily time frame. According to Wilder, the smaller the time period of measurement, the more sensitive it will be, making it difficult to observe; whereas if the time period is getting bigger, it will be less sensitive, thus affecting the accuracy of measurements. So, if you are going to use the RSI indicator at the time frame lower or higher than Daily, it should not be based on the default parameter. If so, how is the adjustment? Basically, the smaller the period setting, the more trading signals will be generated. Daily Traders with a 1 hour down time frame usually use period 9 RSI, while Scalper uses period 7. While medium and long term traders use periods 14 or 25.